Yesterday I took time here on Unbreakable to send my thanks to Matt O’Connor, the goalie for the Boston University Terriers, and my friend, for the hard work that he gave to his team this year and the pride he brought our school in the process. What came out of that was something that could only be described as overwhelming. I wrote that with an audience of one in mind. To see thousands of people sharing in thanking Matt was amazing. All I ever wanted was to share those words with Matt, which thankfully was successful, and show him that we were behind him no matter what. Little did I know that quite literally everyone was. That’s what’s so heartwarming about this story. It did not end as we all hoped with the Terriers as National Champions, but that’s entirely okay. 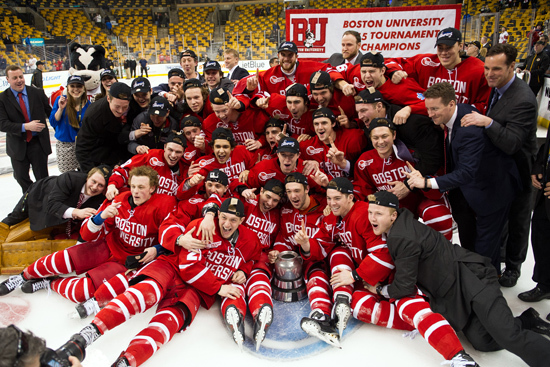 Yesterday it became clear that Boston University was a winner no matter what one game decided. To watch all these voices praising an amazing man, and at that an amazing team, even in the wake of a loss was genuinely moving. The players and coaches of the BU hockey team deserve every last bit of that praise. After only winning 10 games in my freshman year they won the Beanpot, Hockey East, and damn near the National Championship. That isn’t a comeback – that’s a miracle. I do not think I have ever fallen in love with a team as much as I did this year’s Terriers team. They reminded me of why I love college athletics. My parents watched the national title at home and saw these world class athletes that were larger than life. I saw people that I run into every day. I saw friends and classmates. I saw people that were proud to be Terriers much like me. And if the history of sports has taught us anything it’s that memories can be funny. We make documentaries about the Michigan Fab Five despite the fact they lost consecutive national championships. With all due respect to Providence, who played an amazing game and entirely deserve their trophy and victory, I know that one day I will be telling my children about the 2014-15 Boston University Terriers as one of the best teams that ever took the ice. Every student and every person that stood up for the goalie of that team yesterday will do the same. The legacy of this team is larger than any single play or any single game. That’s because the Terriers can be proud of a landmark, memorable season. Another thank you is due to Coach David Quinn, his staff, and the entire team for allowing us all to come along on one of the best rides imaginable. We all know the real champions are here on Commonwealth Ave. Even better yet? This story is far from over. This is one game, one chapter. If there’s anything I can tell you after watching the reactions of everyone around campus yesterday and today it is this: Watch for the Terriers to come back to that title game next year. This time we will take home the trophy. But until then, we will hold our heads high as the best that anyone could have asked for in 2014 and 2015.